Swimming Conditions: Shallow water and plenty of fish make this a great spot for snorkeling. 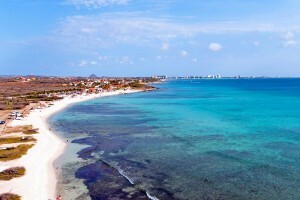 Aerial view of the beach at Boca Catalina, in Noord, north-west Aruba. In the background, Hooiberg and the high-rise hotels. 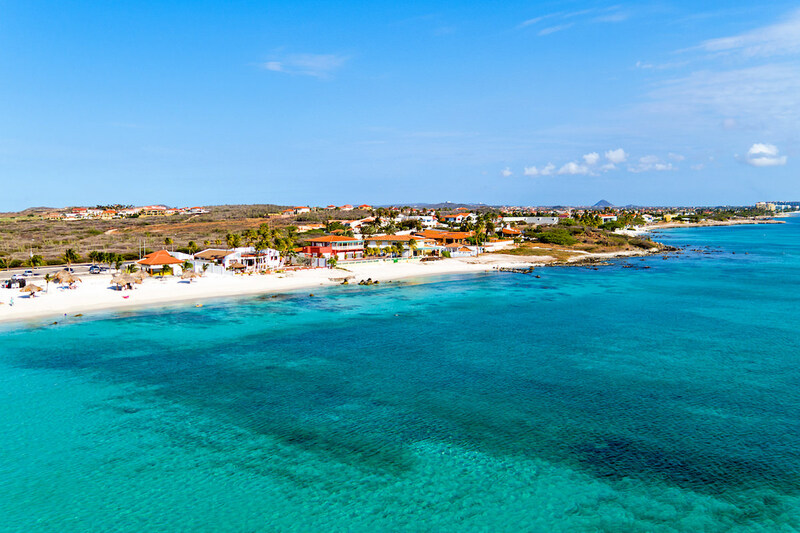 Boca Catalina is hands down one of the best swimming and snorkeling spots in Aruba. Just ask the locals who love to come here, especially in the weekends. 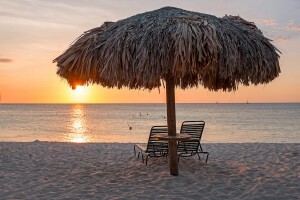 The beach is located in a prestigious residential area, between Arashi Beach to the north and Malmok Beach to the south, just a few miles north of Aruba’s busy high-rise hotel area. The beach faces west, offering stunning views of the southern Caribbean Sea. It has a length of about 350 meters (1150 feet) and can get rather rocky at some spots. Small rock ledges near the shore can make it a bit difficult to get into the water. You’ll want to bring some water shoes to protect your feet. Other than that, Boca Catalina is a beautiful protected cove; the water is warm, crystal clear, with little swell, especially in the early morning when the winds and currents are calmer. Its white sands are the icing on the cake. A sea turtle, spotted off the coast at Boca Catalina beach. Once you’re in the water, you’ll spot an enormous amount of different species of tropical fish within minutes. It’s like you’re swimming in an aquarium. If you bring some bread or crushed crackers, the fish will eat right out of your hand. Chances are you’ll spot some barracuda, parrotfish, starfish, and squid as well. If you go at daybreak, you’ll probably spot some sea turtles. In general, it’s best to go snorkeling at Boca Catalina early in the morning, as this spot is quite popular. Snorkeling trip boats such as the famous Jolly Pirates drop off their passengers on the north side at Catalina Cove in the early afternoon. If you’re up for it, you can swim out beyond the yellow ropes where the snorkel tour boats and catamarans are anchored. That’s where you’ll spot the most tropical fish for sure. If you go snorkeling at Boca Catalina or Catalina Cove, don’t forget to put on plenty of waterproof sunscreen, especially on your neck and shoulders. There’s such a great variety of fish and marine flora to explore, you’ll forget about time. Don’t get sunburnt! 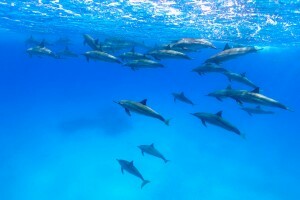 A pod of spinner dolphins in their natural habitat. Wouldn’t it be fun to go swimming with dolphins in Aruba? There’s a good chance you can since wild dolphins do swim in the Caribbean Sea around the island. The intelligent sea creatures tend to hang around in the waters off Boca Catalina, Arashi Beach, Malmok Beach, and the south coast of Aruba. 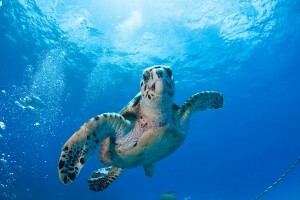 Swimmers and snorkelers are often approached by the curious creatures. If you spot one, there probably will be more, as dolphins usually swim in groups (a group of dolphins is called a pod). When boats or people are around, they usually split up in pairs. When dolphins approach you, just bear in mind that these are wild animals in their natural habitat. They’re not used to humans, let alone humans touching them. Just keep swimming slowly with your arms alongside your body, and enjoy watching the dolphins twirl around you. Never attempt to reach out, touch, chase, ride, harass, feed or otherwise disrupt the natural behavior of the dolphins. Do not approach or swim with dolphins that have newborns, as they may attack you to protect the baby. A cabana, beach chairs, and an amazing sunset. It’s 6 PM at Boca Catalina, time to pop an Amstel Bright. Other than a few cabanas (small beach huts made of wood with a thatched roof made of palm tree leaves) and a handful of trees for shade, you’ll find few facilities at Boca Catalina. You may want to bring a beach chair, although there are beach chairs available for rent for about five dollars. If you want to spend an entire day at Boca Catalina, bring some snacks, a cooler with drinks and a beach umbrella for shade. You can stock up on some local Balashi beer, Amstel Bright, and other groceries on your way to the beach, there’s a “Groceries to Go” store near Malmok Beach, on Malmokweg 7, in Noord Aruba. It’s open 24 hours a day. If you can, hang around on the beach until the early evening at around 6:30 PM; the sunset views are truly legendary. 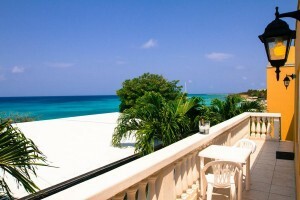 A view from the terrace at Ocean 105, at Malmok Beach Aruba. If you’d like to stay near Boca Catalina, Malmok, and Arashi Beach to enjoy the best snorkeling on the entire island, there are a few beachfront apartments available for rent at Ocean 105, just a few hundred feet south of Boca Catalina. They offer one- and two-bedroom apartments with either garden of ocean views. All rooms are spacious, family-friendly and have air conditioning. Use of a mobile phone and WiFi are free. Beach towels and snorkeling gear are provided to guests. The apartments are perfect for self-catering, the kitchen has all you need to cook a decent meal. The nearest supermarket is the above-mentioned “Groceries to Go” store just a five-minute walk from the property. You’ll love the great sunset views at Ocean 105! Don’t forget to have a chat with Raymond, who runs this place; he’s got some great stories to tell about Aruba and its history! 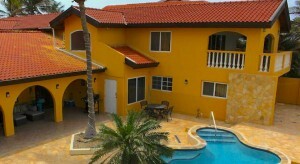 The rental villa at Boca Catalina, with salt water outdoor pool. Right across the street from Boca Catalina beach and the Ocean 105 apartments, you’ll find the beachfront Arashi Beach Villa, a property that’s become available on the market in 2016. From this typical Aruban townhouse, you’ll have quick access to the best swimming and snorkeling spots. It features five bedrooms with high wooden ceilings, each with a private bathroom. The beachfront villa can comfortably accommodate two families or up to 10 persons. There’s a salt water outdoor pool with pool deck, a beautiful patio, and a covered porch. Balconies on the upper floor offer grand vistas over the Tierra del Sol Golf course and the outdoor pool. This rental villa is self-catering, perfect for those who’d like to prepare their lunch and dinner. It comes with a fully equipped kitchen and a breakfast bar. Children are allowed to stay, so this beach villa is very suitable for families as well. For the little ones, there’s a beach stroller available so you can easily bring shovels and buckets to the beaches nearby. If you want to visit Boca Catalina beach by car, just head north along the L.G. Smith Boulevard from Oranjestad. From the center of the city, it’ll be a 15-mile drive, which will take you about 25 minutes. Continue following this road, which bends along the low-and high-rise hotels, until you pass the Ocean Z Boutique Hotel and the Ocean 105 beachfront apartments at Malmok Beach. Boca Catalina beach will be on your left after 400 feet. You’ll see a small parking area with a few Divi trees right by the beach for a handful of cars. If it’s full, keep driving north in the direction of the California Lighthouse for another 1500 feet or so; there’s a much bigger parking lot at Arashi Beach. When you walk back, you can also enter the beach at Catalina Cove, which is the north section of the beach. From Monday to Saturday, you can take the Arubus to Boca Catalina from both the low-rise and high-rise hotel areas. Take Line 10A, which goes all the way up to the south side of Arashi beach. Tickets will only cost a few dollars. Just hop on, and tell the bus driver where you’d like to go.